Hi all, first post, sorry it’s about a problem. I really like LaunchBox sofar! “F:\LaunchBoxEmulators\RetroArch\retroarch.exe” -L “cores\genesis_plus_gx_libretro.dll” “F:\LaunchBoxRoms\ROM GAMES\SEGA-Genesis-Popular\Cannon Fodder.bin”"
“F:\LaunchBoxEmulators\RetroArch\retroarch.exe” “F:\LaunchBoxRoms\Golden Age of Video Games\Sega 32X\After Burner Complete.bin”"
Notice that the -L "cores\picodrive_libretro.dll" is missing. 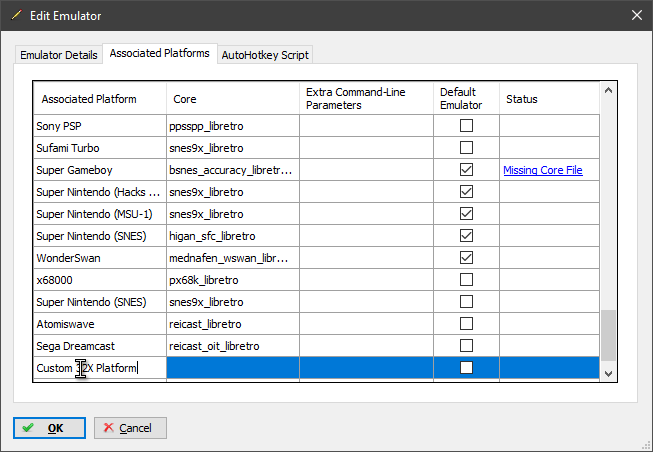 I’ve tried to add it back using the custom command line arguments in the RetroArch emulator settings, but it won’t take it. pico is associated to the 32X platform, and so are the roms, all that checks out, and I haven't fiddled with any of the naming. 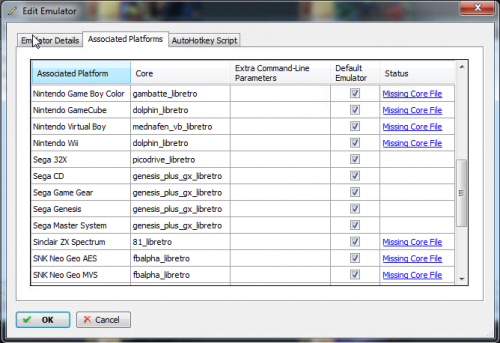 I also manually deleted the cores, updated RetroArch and re-downloaded the cores, same problem. Also rebooted a few times. I’m having trouble getting the two hooked up. Otherwise everything is going great! I really like LaunchBox and I can tell the developers have really gone out of their way to make a very nice GUI for the user. It’s the best looking / operating front end I’ve seen and I’ve tried a bunch. Can you post a screenshot of your Edit Emulator window for Retroarch and your Sega 32X and CD. Ok I see a couple of things. Are you actually trying to load 32X CD games ? Your title says it but I see nothing else about it. You don't have a 32X CD platform and 32X CD games are their own platform. They will not work with the Genesis GX core. 32X games work perfectly fine for me using the picodrive core. You mentioned I don't have a 32X CD platform - how do I go about adding that? 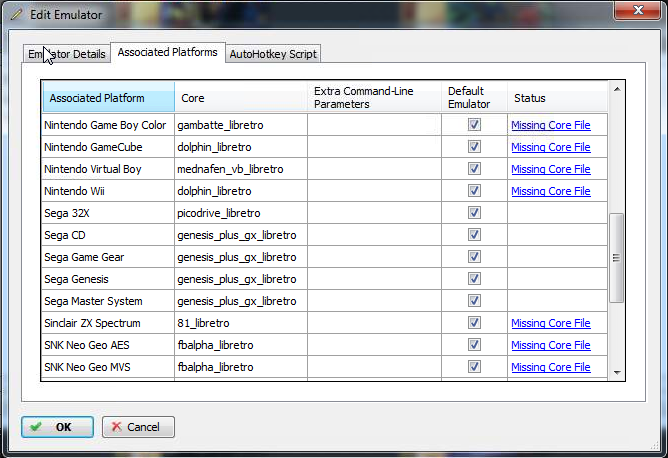 And I agree picodrive core is working, when I manually scan and run this file in RA it launches successfully. I just can't get LaunchBox to launch it for me. 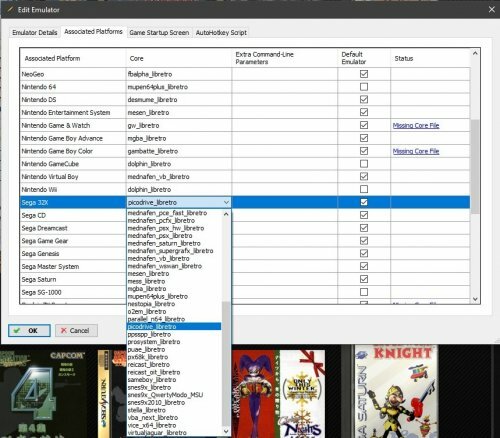 You can add the Sega 32X CD platform by going to the bottom of the Associated Platforms, just click in there and type it in. Your 32X games are imported under Sega CD 32X when they are Sega 32X. Change the platform name to Sega 32X and they will work since that is what you have in your Associated Platforms already. And then when you get 32X CD games you can import them to the Sega 32X CD platform and add that platform to the Associated Platforms for Retroarch. Yeah there was a total of 6 32X CD games, all of them awful FMV games. These games required both the CD and 32X addons while regular 32X games only used the 32X addon. You need to use the Pico core for 32X. Use the drop down menu in the core column, just click in there twice. Just make sure you have the core downloaded first, you may have to reload LB if you don't have the core already and have to get it. 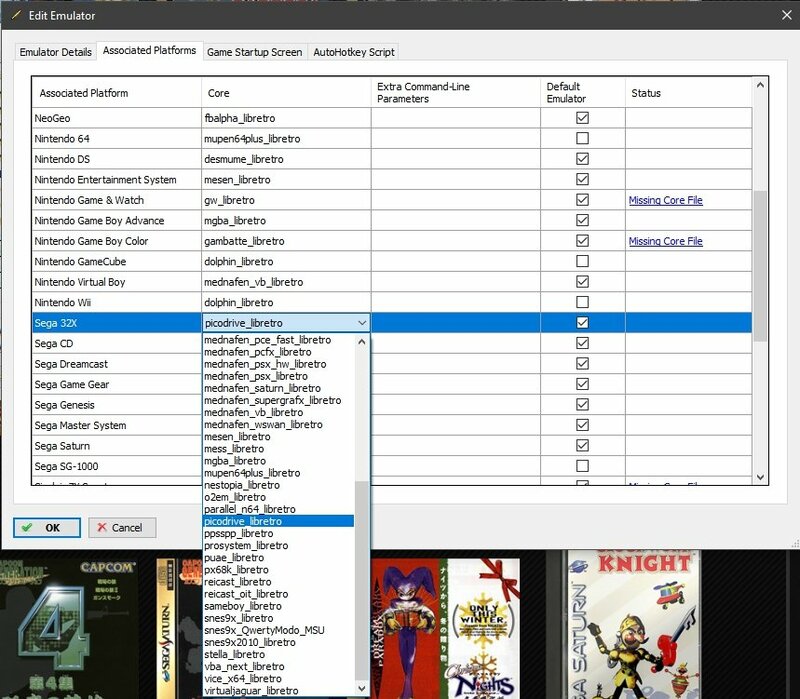 hi, i cant even select sega 32x in the associated platforms list. its missing. what am i doing wrong? i add pico to retroarch and it installs the core. 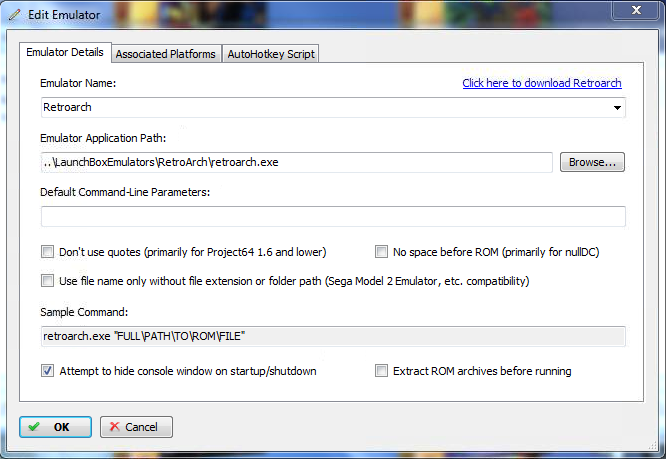 but i cant launch games from retro arch for 32x either. 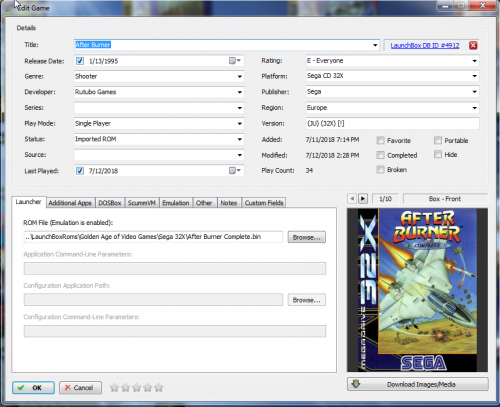 then when i import games for 32x into launchbox, it displays the default rubix cube pic. it wont grab metadata. i followed that video, but somethings going wrong somewhere. oh and im definitely sure im choosing 32x and not cd 32x. i make sure i select the right core and system.